Today, I'm pleased to introduce Susana Ellis. 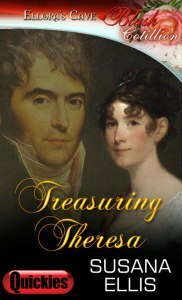 Her debut novella, TREASURING THERESA, has just been released. This is a very special interview because the author has included an excerpt of her book and is giving away an Amazon gift card! ATW: Welcome, Susana. Before we talk about your book, can you tell us a little about yourself? Susana: I've dreamed of being a full-time writer since high school, but by the time college rolled around, it didn't seem practical, so I became a teacher instead. I taught for many years and then one day, it occurred to me that life is short and if I really wanted to be a writer, I should not let anything stop me from doing it. That was over a year ago, and I haven't looked back since. Susana: As a child, I used to tell stories to my younger siblings while doing household chores. When I learned to read, I devoured books any time I could. I'm convinced that all that reading was instrumental in making me a good writer. In fourth grade I wrote plays for my friends and me to act out. I still read a great deal—mostly romance, all sub-genres. It seems like the more I read, the more characters clamor to be released from my imagination into a story. ATW: Can you tell us about TREASURING THERESA? Susana: Lady Theresa is the daughter of an earl who has lived most of her life in the country. She loves the challenges of managing her father's estate, and she's always expected to marry Reese, the boy next door who shares her interests, and they will both be idyllically happy. Unfortunately, Reese proposes to another girl, and now Theresa is obligated to attend his betrothal ball, knowing that everyone there feels sorry for her. Then she sees Damian Ashby, one of the top Corinthians in London, and decides to make a play for him in an attempt to divert attention from her own situation. In reality, she can't stand London fribbles like him who live only for their own pleasure, but it's only for that one night after all. Damian is appalled at this impudent girl's lack of manners, but since he's the one who will succeed her father to the earldom, he refrains from giving her the cut-direct. He is strictly a London swell, with no appreciation for the country life…except for a good hunt now and then. He's exceedingly grateful that he doesn't ordinarily have to deal with country chits—even those with the most amazing cerulean blue eyes—in his life. Except that Lady Theresa's father becomes seriously ill, and Damian is required to go to his estate in the country and be guided and instructed in estate management by Lady Theresa herself. But the Theresa he finds there is not the same flighty chit he met in London. She seems to become more attractive as each day passes, and to his surprise, the fresh air and natural beauty of the country have an equally alluring effect on him. Both Damian and Theresa discover admirable qualities in each other that could lead to marriage. But Damian will never be a farmer, and Theresa doesn't care for the superficiality of London society, so how will they ever be able to merge their diverse lives together? ATW: How did you get the idea for the book? Susana: It's a sort of “Pride and Prejudice” tale, where two characters assume the worst of each other and then learn that their original assumptions are wrong. And also that two people who seem polar opposites can actually learn to balance each other out quite nicely, if they are motivated to do so. ATW: I understand you recently participated in NaNoWriMo. Can you tell us about this competition and what you learned from the experience? Susana: November is National Novel Writing month, where many writers commit themselves to writing at least 1667 words a day—a total of 50,000 words in 30 days. As a full-time writer, I didn't think this would be that much of a challenge for me; my teammates had day jobs, after all. But it turned out to be much harder than I had anticipated. There were days when I made myself write for the sake of the team even though I fought it all the way. There were days when I was traveling where I had to get up earlier than usual or skip dinner to get at least something written for the day. And there was a point in the middle where I felt like something was wrong, but instead of going back and trying to fix it, I had to keep on writing so as not to let my team down. In the end, I think that was a pivotal moment, because as I continued to write, I got to know my characters better, which is why I had the problem in the first place. I think the problem I've had in previous novels is to stop and try to “fix” things too soon, which causes me to get bogged down. From this experience, I've learned that what I need to do is keep writing through it, and go back to it later when I'm better able to deal with it. Susana: I still have four chapters left in this NANO novel, which will probably be around 70,000 words when it's finished. Then it will go through the revision process. I also have two novellas to be revised, so hopefully you will see more from me in 2013. All Regencies, of course! Susana: TREASURING THERESA is my first published work, and it's a longer-length short story available at Ellora's Cave Publishing on January 3, 2013, and a week later at Amazon, Barnes & Noble, and other e-book retailers. I have a web site (www.susanaellis.com) and a blog, called Susana's Parlour (http://susanaellisauthor.wordpress.com/). Please friend me on Facebook (susana.ellis.5). I'm sort of a Facebook addict! Damian Ashby, Viscount Clinton, looked down upon the festive ballroom with a critical eye as he waited in the reception line. Greek statues and scrolled Ionic columns, along with draperies of white and gold and a profusion of candelabras wrapped in ivy, trumpeted the classical theme. A brief survey of the guests confirmed his suspicion that the Sedgelys did not socialize in the first circles of the ton. Except for his cousin, the Earl of Granville, whose heir he was and at whose behest he had deigned to attend, Damian himself appeared to be the highest ranked in attendance. And frankly, he’d rather be indulging in an intimate dinner and sensual dessert with his mistress than attending a provincial betrothal ball held for two people he’d never met. “Charmed, I’m sure” he said disdainfully as he greeted his hosts. The pudgy Mr. Sedgely, a banker, and his horse faced wife, second cousin to a baron, socialized on the fringes of the ton, which is why he’d never encountered them previously. “Indeed,” Damian replied, shuddering inwardly at the thought of socializing with such boorish people. After he inherited, he planned to reside at Granville Manor for one week annually during the hunting season. The rest of the year it would be left under the management of a capable steward while he continued to enjoy the pleasures of civilized society in London. He was calculating the most direct path to the card room when a young lady pounced on him. She was passably pretty, he thought, although her marine-blue gown was not in the first stare of fashion. He could find no fault with her small waist and full breasts, although he personally preferred a more voluptuous figure. Her hair was too dark a blonde to be in vogue, and the simple chignon indicated that she had arranged it herself without the assistance of a maid. But it was her tantalizing eyes that drew his attention—a deep cerulean blue that reminded him of the Adriatic Sea and a pleasurable interlude on a beach with a sultry Greek barmaid during his European tour a few years ago. She swatted his arm with her fan. His memory yielded the image of a younger version of the girl before him. Barely out of adolescence, she’d been as provincial as the others in the tedious party. He could have—should have—cut her for her impertinence. If he’d been ambushed in such a manner by any other young lady at a ton ball, she’d have been dealt a severe set-down. But among a roomful of provincials, Lady Theresa, as the daughter of an earl, outranked everyone except her father and himself. And seeing as she was the one who would be displaced when he inherited her father’s estate, he decided to ignore her lapse in manners. More or less. “How fortunate that we both have this dance available,” he said with a hint of reproof. “Oh la,” she said. “I don’t have so many partners that I must write down their names. And you just arrived,” she said with a triumphant smile. A country bumpkin, thought Damian in disgust. Bruiting about her own unpopularity so candidly. She would be a pariah at any civilized ball. She danced surprisingly well for a country girl, he thought as they whirled around the room. She felt good in his arms and the scent of her hair wafted up to his nose. Lavender. Her astonishing eyes peered up at him, sparkling with interest. Oh no, he groaned inwardly. Here it comes. Was it only his imagination that her voice shook slightly when she said that last word? To celebrate the release of TREASURING THERESA, author Susana Ellis is hosting a series of contests on her web site (http://www.susanaellis.com) for the month of January. All you have to do is answer a question about the Regency period and your name will be entered for the next drawing. Winners will be chosen on January 9, 16, 23, and 31. Great interview! Thanks and congrats, Susana!